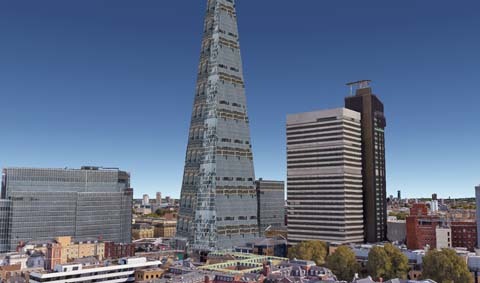 London, UK - Zehndorfer Engineering has finished a Glint and Glare Study of the glass facades of The Shard. 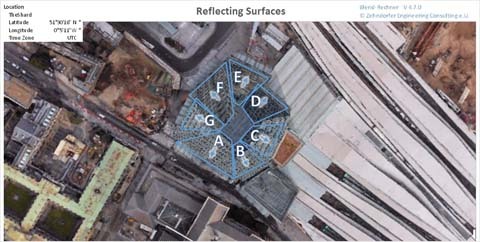 The purpose of the study was the investigation of the sun reflections on the many glass facades of the high-rise building, which has reportedly caused dazzling among train drivers on the south-eastern train tracks leading to the London Bridge Terminal. Not far from the place of investigation, in 20 Fenchurch street, another building had been destroying a car when its facade reflected sun rays. While the effect of the reflections in this case are not that harmful, they still can be a nuisance for traffic and neighbours. 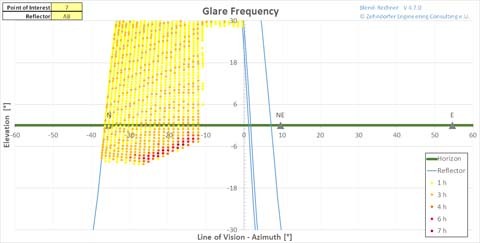 In order to develop a full understanding of the buildings glare impact a glare simulation was done for several points of interest such as the train tracks, neighbouring roads and an adjacent building. Glint and Glare can have a dazzling effect and cause after-images, especially when looked at directly, so that the glare lies in the centre of the visual field. While glaring from side angles or from above have less of a chance to cause dazzling, straight and level light rays can be quite disturbing. While looking into the sun essentially has the same effect, reflections are typically larger in size and they can come from lower angles, where most of our daily visual tasks are located. Train drivers, for example, need to look at light signals at the side of the tracks, a task that can be impaired by glaring from behind the signal. This effect, called masking, leads to not being able to clearly see an object when its luminance is several orders of magnitude below the luminance of another object (in this case the glaring surface). With its height of 309.6 m being the tallest building of the UK, The Shard has several huge glass facades oriented in different directions. Due to this the probability of reflections is higher than for other buildings. Most of its facades are also slanted under an angle of approximately 5°. The effect of this slope is a bending of the sun rays, so that the apparent elevation angle of the reflection is 10° lower, than the original elevation of the sun. So, while a completely vertical facade only changes the horizontal direction of the reflected sun, a sloped facade also seems to lower then sun, thus causing longer durations when the reflection has the potential to disturb our mainly horizontal field of vision. For the glare simulation, the different facades are set up as flat reflectors pointing in different directions. Critical points of interest were chosen above the train tracks, above the roads and at 50m height on the adjacent building. 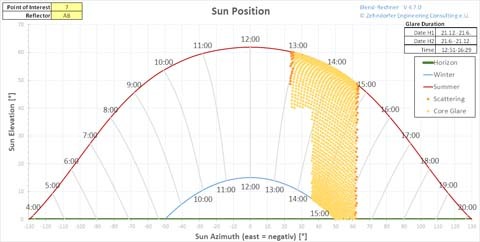 In the glare calculation the sun position over the whole year is simulated and the potential to reflect sun-rays towards the points of interest is verified. If reflection from the position is possible, the glare duration is accumulated by counting the positions of the sun on which glare is possible. The glare simulation allows the exact quantification of the glare duration on the train drivers. It turns out, that there is a 20 minutes time window per day to reflect sunrays towards the trains. Unfortunately, the viewing angle between the glaring surface and the heading of the train is only 1°, which means that the train is moving directly towards the glare. For the adjacent building a maximum glare duration of 135 minutes per day has been calculated. This means that the otherwise not shined upon north side of the building will see direct sunlight for a considerable period. The reflections will also include a good share of infrared (heat) rays, which will lead to a additional cooling needs during summer. The impact of the glare on the human eye has also been calculated according the Solar Glare Hazard Assessment procedure. Reflections of the sun in this case can lead to temporary after-images. Zehndorfer Engineering regularly executes Solar Glare Assessments for Buildings and Solar Power Plants. Jakob Zehndorfer is Expert Witness for Solar Glare Assessments.